The addition of a water feature to your backyard pool and spa project can inject an added acoustic and visual dimension. The design professionals at IVY Studio, a landscape design and build consulting firm based in Massachusetts specialize in expanding outdoor environments where a pool and spa are often the focal point. Some of these features include fountains and waterfalls that can be stand alone items or indeed incorporated into the swimming pool and spa itself. 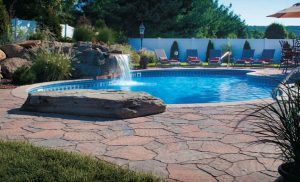 Natural stone water fall elements than blend with the coping of a traditional pool or more contemporary sheer water descents built with glass tiles are just some of the options available. Other ideas include deck jets that shoot arcs of water from the edge of the deck into the pool and rainfall curtains that create dramatic special effects. Contact us at 781-591-0300 or vern@ivystudioMA.com to learn how these and other water features can be incorporated into your pool and spa design.